Stamps are ideal for the office or for personal use. Whether you need a Stamp for your name and address on the back of envelopes or a stock stamp with “PAID” or “NOT NEGOTIABLE” to keep your paperwork at home in order, we can help you with all your stamping needs. At work, stamps are an invaluable addition to the office providing a wide range of possibilities and options. You can use a stamps for Signatures, dating documents, approving expenditure, processing invoices, name and address, goods received, deliveries refused, numbering documents, the uses are endless. We can make anything that you need to make life easier in the office. If you are having trouble deciding which stamp would best suit your needs just send your information to us and we will sort out the best option/s for you. Draw a rough draft and fax or email the copy to us and we will provide a proof for your perusal. Stamps are particularly handy for tabulated formats where you need to hand write information, tick boxes or circle the required option. If you have an existing stamp that needs re-inking we have all the inks and pads you will need to keep your stamp impression at its optimum. To make sure the correct ink is being used for your stamps contact us as the use of the incorrect ink can reduce the life of your stamp. 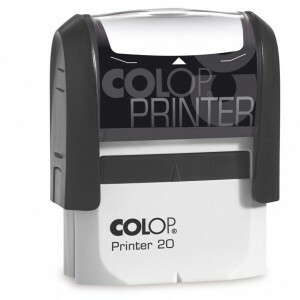 Self Inking and Hand types use a water based ink. Pre-Inked Stamps use an oil based ink. Putting oil based ink in to a Self Inking stamp will affect the rubber and pad causing it to swell which distorts the stamp impression. We also have a range of Art Stamps useful for making cards and posters. Our Art Stamp range will be on-line soon. For prices and sizes click on the type of stamp you are interested in from the menu above. To help you decide which type of Custom Rubber Stamp you require click on the relevant link to see the wide range of options available. Artwork for Logos can be sent as a pdf or eps file with a minimum of 300 dpi. Artwork needs to be a Black and White image..